TPU Cushioning Air Maxx TPU cushioning that is used in our best performing helmets is featured in our new Air Maxx Flex 2.0 Shoulder Pad Series. TPU cushioning is positioned over the shoulders providing enhanced impact absorption. Air Maxx TPU is durable and will not break down – even after thousands of impacts. Energy Lock Technology Powered by D3O® Energy Lock Technology powered by D3O® is a lightweight, soft, and flexible material featuring unique molecular properties. In standard conditions its molecules flow freely, but on impact, they lock together to absorb impact energy and reduce the force transmitted. The material is rate sensitive, so the harder the impact, the greater the resistance to the force. Our D3O® foam is strategically positioned over the shoulder for optimal impact absorption. 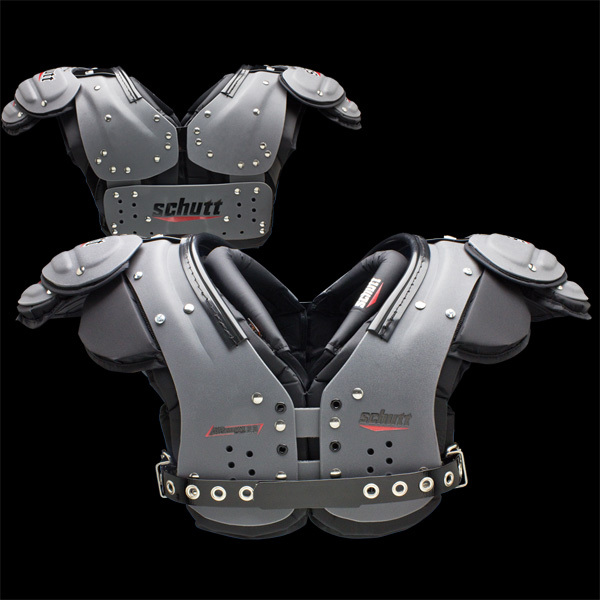 Clavicle Channel System System absorbs impact specifically around the AC joint and provides maximum shoulder protection. The hook and loop pad attachments can be re-positioned or removed to ensure a precise fit and complete coverage in the key hitting areas. 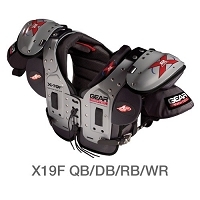 The Schutt Air Maxx Flex 2.0 QB/WR shoulder pad is a top of the line pad for quarterbacks and wide receivers. This pad does a great job of protecting vital areas and does not slide up on the body upon impact.